Hosting: I have been hosting my sites on Webfaction[^1] for close to a decade. After comparing many of the other hosting plans, I have concluded that they have the best deal for shared hosting. More than the price, what keeps me with Webfaction is their excellent customer support. They seem to work round-the-clock to help their customers. Illustrations: I believe illustrations (or images) should accompany posts to make the point clearer. 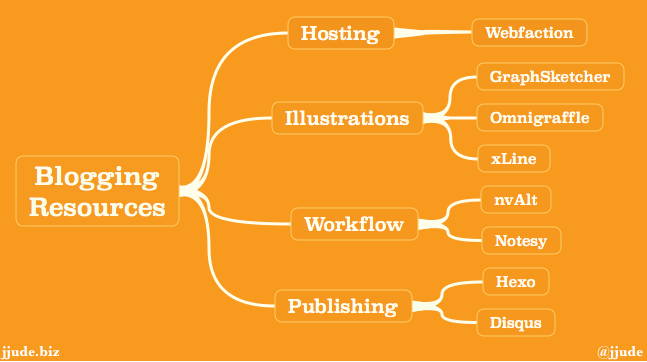 I use xLine for mind-mapping, like the one above. I use GraphSketcher for simple graphs as in this post. It is simple to use and open-source. For all other illustrations, I use Omnigraffle. My Workflow: Most of my posts start as a quick note in Notesy, a dropbox based iPhone app. It helps me capture thoughts that flash through. These quick-notes are later expanded on my Mac using nvAlt, another dropbox based note-taking app. Until a post is final, editing happens on both of these apps. I use TextExpander for entering repetitive texts like headers for blog posts. Final touches, if any, are done in TextMate before publishing. Publishing: After running with Wordpress for many years, geek in me took-over. I switched to a static blog engine. thlt is a self-coded blog engine in nodejs. Two primary advantage of static blog: 1) it loads fast 2) all my posts are now in source-control. I use Disqus for comments. [^1]: This is an affiliate link, which means that if you decide to buy something using the link, I get paid a tiny referral fee. If that bothers you, please type in the text of the link into Google and proceed from there - no harm, no foul. If you do decide to buy through my affiliate link, well, thank you!